Talk about WOW factor! 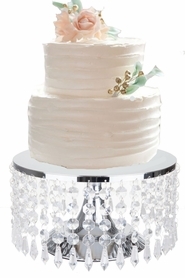 We're very excited and proud to introduce this posh Prestige Silver Cake Stand and Centerpiece Riser that's loaded with GENUINE Crystal Beads and gorgeous hanging Crystal Pendants! This upscale display stand is quite elegant and classy just by itself and it not only makes an awesome riser for desserts but it's also the perfect platform for any variety of centerpiece designs. This riser is 16 1/2" tall by 11 3/4" wide and it's a solid, sturdy piece that weighs 6 1/2 lbs. The finish is antique silver that's shiny and reflective with a very light brushed look which really adds to the lavish look. 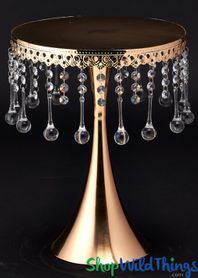 This impressive stand is embellished with 17 crystal drop pendants that are so clear you can literally see through them! Each pendant is 4" long and in between each crystal ornament is a 2 1/2" long strand of crystal clear beads. The beads are faceted and absolutely stunning! 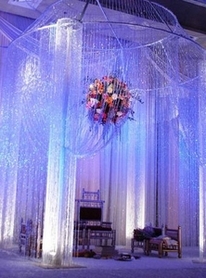 All of the hanging crystals can easily be removed or rearranged. Our crystal beads are real crystal, not acrylic and they are faceted on all sides. You will find sellers who "sneak" in plastic beads or mix acrylic with glass beads. We are fanatical that this is NOT done on our products. For wedding and anniversary decor, parties and celebrations, showcase your finest on this ritzy stand. Pies, cakes, cupcakes and treats never had it so good or you could create your finest centerpiece. Clear glass vases and candle holders look incredible on this pedestal and all you need to complete the look is to use water jelly pearls, fairy lights, colorful submersible LED's or diamond confetti and add or float flameless LED candles! Simple, classy and you won't believe how divine floral bouquets and arrangements look! Delight in all the fine quality items we carry in our Prestige line and you'll be proud to show them off at your next event or enjoy in your everyday life! Prefer Gold? We have this identical stand in Gold! 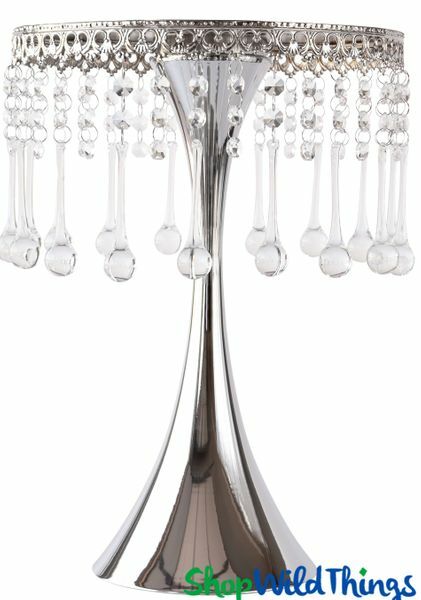 Please take care with the glass crystal drops and before cleaning or storing, we advise that they be removed. I love this cake stand.